What is Thump Boxing and Kickboxing for Fitness? THUMP Training Systems was developed in 2001 by Christian Marchegiani, a boxing for fitness trainer in New York with the YMCA. On returning to Australia Christian noticed a massive cultural shift in group exercise training. As the demand grew for more instructor training and education, THUMP Training Systems developed into a national organisation, with over ten presenters, and three certification courses. 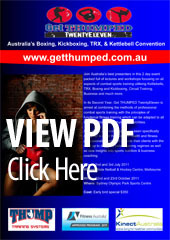 THUMP Boxing is now taught in over 60 gyms/fitness centres across Australia, New Zealand and the UK while THUMP Training Systems is committed to providing the most up to date research and education to all fitness and health professionals. Since 2007 the Head Coach has been a National Fitness Presenter for Thump Training systems and is now the Senior National Presenter for the company taking him regularly interstate to Perth, Melbourne, Darwin and of course Adelaide. He has been heavily involved in the designing and coaching of the current Level 1 and 2 courses and the Level 3 “Punch” and “Kick” Super courses. The courses are designed to give boxers, personal trainers, group fitness instructors, coaches, enthusiasts and alike further education and industry recognized certification through Fitness Australia and Kinect, in correct and safe pad holding, structuring safe and effective workouts and correct technique. Why Boxing and Kickboxing for Fitness? With boxing and kickboxing trainings immense popularity and proven benefits it’s hardly surprising to learn it is one of the most preferred forms of exercise among Personal Trainers, Fitness instructors and self defence and martial arts school owners. Weight loss, coordination, balance, muscular endurance, power, speed and cardiovascular fitness are only a fraction of what this training can offer. It is also not limited to people that want to lose weight and get fit but it is now a common form of training for professional and elite athletes wanting to cross train and enhance their performance on the sporting field. Using a variety of skills and techniques, boxing and kickboxing for fitness as a form of exercise can be transferable to a range of sports including soccer, rugby, cricket, swimming, tennis, and dancing. A fair bit of research has been done on the advantages of boxing for fitness over other recreational activities and the results speak for themselves.